The eastern and southern edges of New Jersey are coastline. 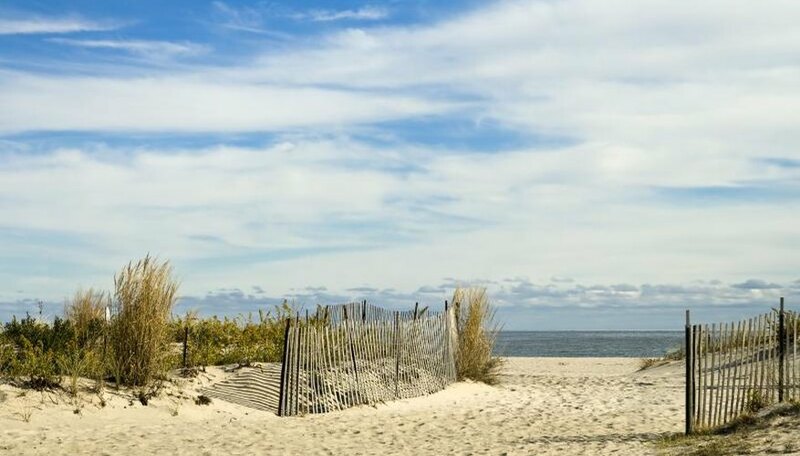 Tempered by the water mass of the Atlantic Ocean, New Jersey's coastal zone is warmer than inland areas during fall and early winter and cooler than them in spring. The eastern shores fall mostly within U.S. Department of Agriculture plant hardiness zone 7a, with the southern shores in USDA zone 7b. New Jersey's shoreline plant communities include marshes, sand dunes, the beach heather and shrub thicket communities, and dune woodland. Various grasses, sedges, shrubs, vines, wildflowers and trees grow in these areas, many suitable for planting in a landscaped yard. Taller evergreen trees that grow in New Jersey's shore areas include pitch pine (Pinus rigida), which grows in USDA zones 4 through 7 in dune woodland, and red cedar (Juniperus virginiana), which grows in USDA zones 2 through 9 in shrub thickets and dune woodland. 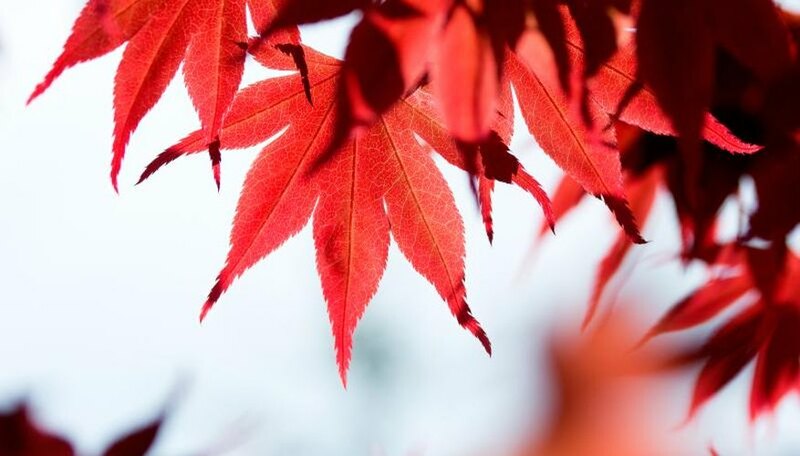 Deciduous large trees in shoreline areas include red maple (Acer rubrum), which grows in USDA zones 4 through 9 and sassafras (Sassafras albidum), which grows in USDA zones 5 through 9a. Among the shrubs that grow along New Jersey's coasts are colorful highbush blueberry (Vaccinium corymbosum), which grows in USDA zones 3 through 8 with white, urn-shaped spring flowers and edible, dark blue summer fruits. 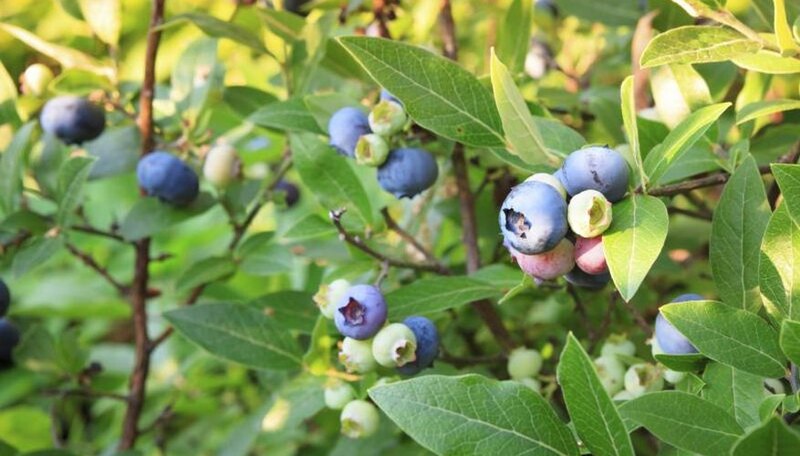 Blueberry plants do well in acid soil and reach 6 feet tall and wide. Aromatic olive-green foliage characterizes bayberry (Myristica fragrans), and female bushes bear waxy, blue-gray berries traditionally used to make candles. Growing in USDA zones 3 through 7a, bayberry bushes usually reach 10 to 20 feet tall and wide. One of the few vines that clamber over trees in dune woodlands and shrub thickets is roundleaf greenbrier (Smilax rotundifolia), which grows in USDA zones 7 through 10. Roundleaf greenbrier produces sparse leaves and grows quickly to 15 or 20 feet with large, round, pointed-tip leaves, white summer flowers and purple berries in fall on female plants. Sharp, curved spines grow along the stems. Growing in more open areas, the showy-flowered beach pea (Lathyrus japonica) grows in USDA zones 3 through 7. 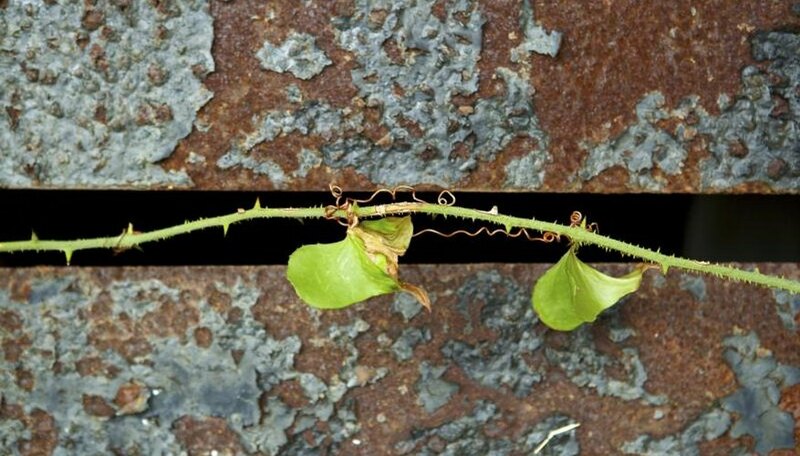 The 2-foot vine produces pink and white flowers. 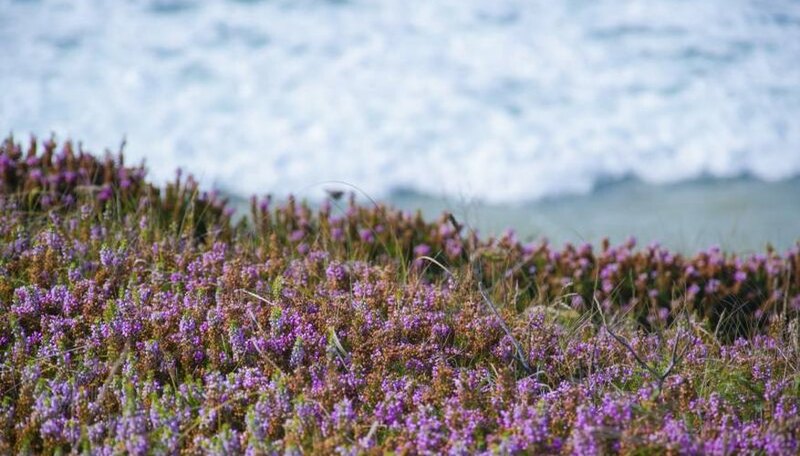 It's most common in New Jersey's sand dune and beach heather plant communities. Both annual and perennial wildflowers grow along New Jersey's shoreline. An example of an annual wildflower, sea rocket (Cakile edentula) grows in full sun in dune and beach heather areas, preferring sandy soil. A member of the mustard family, it has small, whitish-lavender flowers and spoon-shaped, somewhat fleshy leaves. It grows 2 feet tall and wide. A perennial wildflower, sea lavender (Limonium carolinianum) grows in salt marshes in USDA zones 4 through 8. Tall flower stalks rise to 2 feet tall, holding branches of wispy-looking, small lavender flowers suited for fresh or dry arrangements. Flowering in late summer and fall, the stalks come from a basal rosette of large, green leaves. Grasses are the predominant plants in New Jersey's marshes. They help stabilize the soil and provide food for wildlife. Native to salt marshes, spike grass (Distichlis spicata) grows about 1 foot tall in USDA zones 2 through 10. It tolerates both dry and wet conditions, with mat-forming roots that prevent soil erosion. 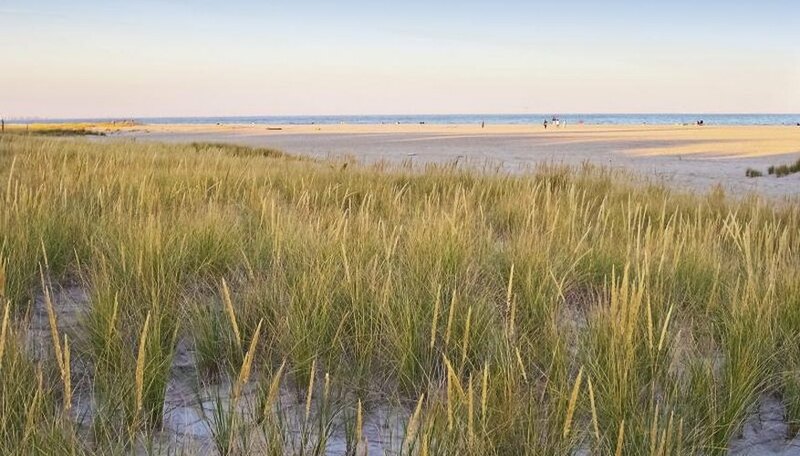 A taller grass common on dunes, beach grass (Ammophila breviligulata) grows to more than 4 feet tall in clusters, rooting deeply into sand, stabilizing coastal dunes. It needs full sun and well-draining soil. Growing in USDA zones 4 through 8, beach grass is considered invasive in some areas. Plants for a Future: Pinus Rigida - Mill. Plants for a Future: Vaccinium Corymbosum - L.
Plants for a Future: Lathyrus Japonicus - Willd. Plants for a Future: Cakile Edentula - (Bigelow.) Hook. Plants for a Future: Limonium Carolinianum - (Walter.) Britton. Plants for a Future: Ammophila Breviligulata - Fernald.